I did speak too soon earlier this week when I thought my hummingbirds had flown off on their southern journey. I left the flowers outside this one last day, and, with a hint of sun breaking in and out of the clouds late this afternoon, one solo male stopped by briefly for a visit. Due to an influx of ants, I pulled the liquid feeder in the house but decided the flowers looked pretty out on deck. This male didn’t seem to mind the clicks of the shutter, so as he traversed both bouquets of flowers I shot with abandon, taking about 100 photos before he flew off. I waited at the doorway for about 15 minutes, but he never returned. So, after the sun set behind the ridge I collected the flowers, swept off the remaining ants and put away the hummingbird feeders until next year. Thanks to this little bird, I had a nice exclamation point to finish off my summer of hummingbirds. …..and sweet Mr. Hummingbird had a full tummy to begin his journey to Belize. That is where many of the NC hummingbirds migrate and I wonder if that is true for VA hummers as well? We are still seeing them in Tennessee! Wow what a great way to end the season till next year. The light is perfect!!! You certainly got some fantastic shots this year. A nice exclamation point indeed! 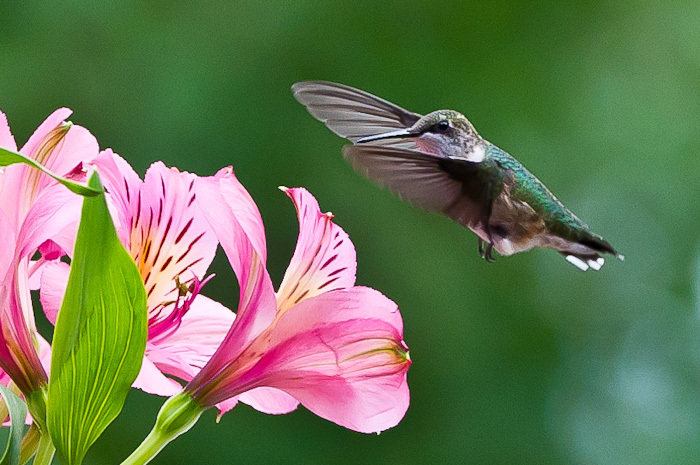 I adore hummingbirds and enjoyed seeing this beautiful photo, Tricia! I’m so glad he showed up again. Our birds are still visiting the feeders. Today is our first day back after four days in NC. We spent a couple hours thoroughly cleaning the feeders and replacing the food. It will be interesting to note when they migrate. I’m hoping we have another 2-3 weeks.